Grandma J’s Rolled Sugar Cookies – A lightly sweetened, moist, cake-like sugar cookie with whipped vanilla buttercream frosting. A family favorite recipe passed down from generation to generation. 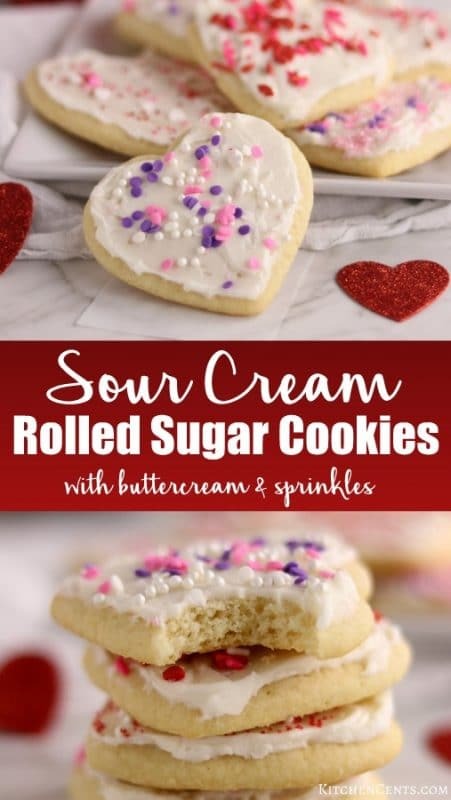 This is the best sour cream Rolled Sugar Cookie recipe I’ve made! This sugar cookie recipe is easy, cheap for how many cookies it makes and isn’t overly sweet after frosting. They come out moist and almost cake-like. The cookie itself isn’t overly sweet so this is the perfect rolled sugar cookie recipe for cutting into fun shapes and decorating with frosting, sprinkles and colored sugar. This is our favorite cookie for Valentine’s Day! Grandma J is my mom’s mother. She was an amazing woman and awesome grandma that knew her way around the kitchen. 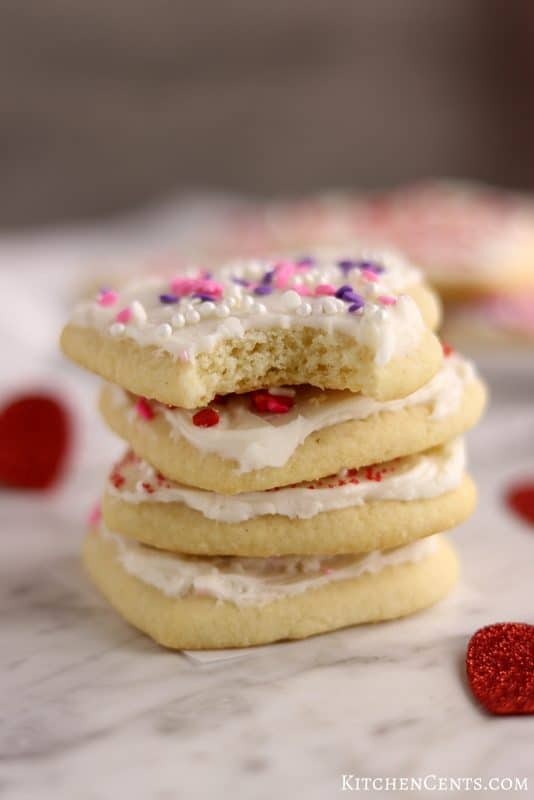 This sour cream Rolled Sugar Cookies recipe is dear to my heart because of her. I had the wonderful opportunity to live next to my grandma J growing up. She was an excellent cook and baker. She loved sharing her goodies with family and friends (I think I inherited that from her). Often times, my family, only living a 2-minute walk from her home, was the recipient of her deliciousness. My grandma had 8 children. Most of her children, my mom included, had 4+ kids. At the time of my grandma’s passing, she had 92 descendants. She had a very large family, to say the least. 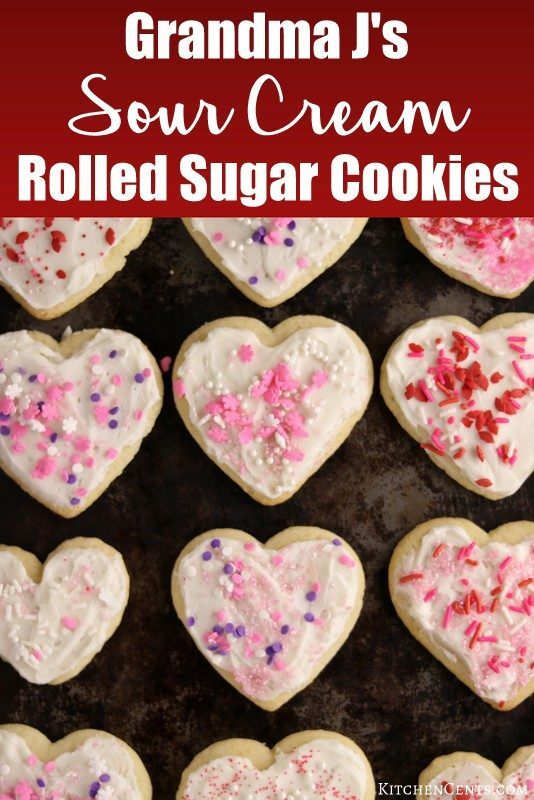 What makes these rolled sugar cookies so special? Not only are these rolled sugar cookies delicious and perfect for any occasion, but they also bring back special memories of my Grandma J. 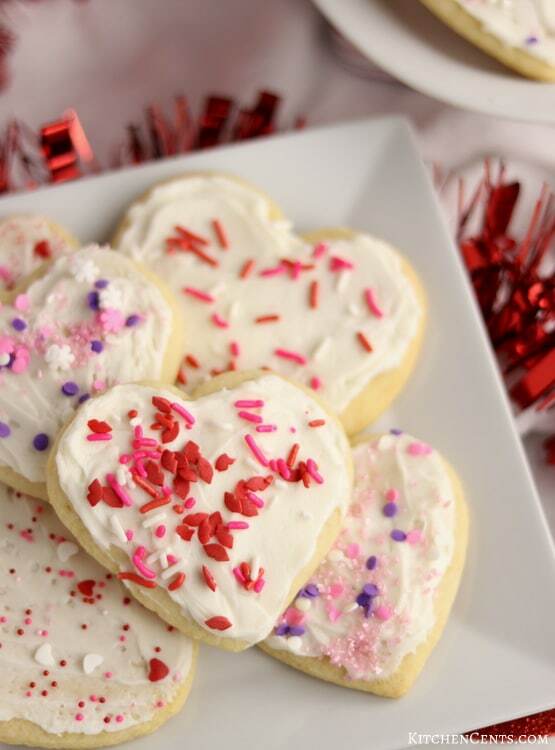 Growing up, she would make these amazing sugar cookies for Valentine’s. They were large, beautiful hearts frosted with store-bought cherry frosting (probably because it was pink and she’d make a 100+ cookies)! She would make one for each child, grandchild, and a few for her closest neighbors. They were the best sugar cookies! A lightly sweetened, moist, cake-y sugar cookie with sweet buttercream frosting. The cookie itself wasn’t overly sweet so the frosting made them just right. My big sister and I loved visiting on cookie day. Walking into my grandma’s kitchen to see the counter tops lined with dozens and dozens of pretty pink cookies. A few times she even decorated each cookie with the recipient’s name. She was amazing and I sure miss her! Remembering loved ones by continuing traditions! I’ve continued this tradition with my family. 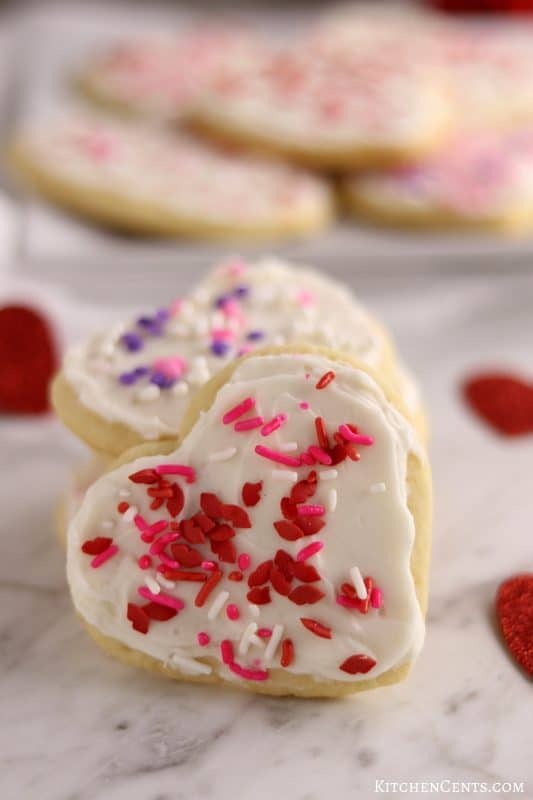 Around the season of Love, we make a couple batches of these delicious rolled sugar cookies and deliver them to friends, family, and neighbors. This year was the first year EVERYONE (the husband and all the kiddos) helped decorate. It was soooo fun! Although I choose to make homemade buttercream (recipe below) you can use your favorite store-bought frosting if you’d like. When I’m feeling like enjoying some memories with these cookies, I still reach for that same store-bought cherry frosting my grandma used. They taste just like hers and I love them for that reason! What should I do if my rolled sugar cookie dough is too sticky? This dough will be a little sticky right after you mix it. A little meaning, it will stick to your finger if touched but will also still hold a shape. It needs to be refrigerated for at least an hour (if not longer) or placed in the freezer for 30 to an hour before rolling. This will help the dough stiffen up without adding to much flour. 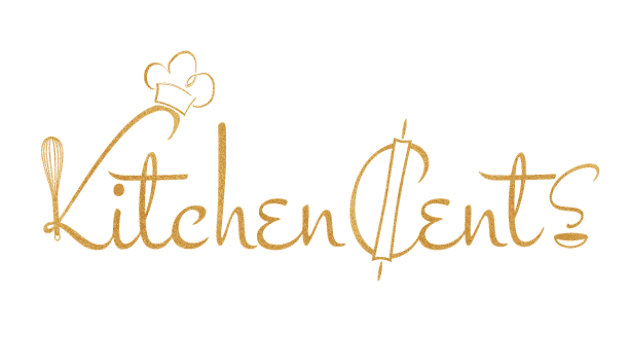 When rolling the dough you will use a well-floured surface and flour the top of the dough or it will stick to the rolling pin. Once cold, this rolled sugar cookie dough should hold its shape and not stick when using flour on the surface. Do I have to use buttercream frosting for these cookies? No! If you have a favorite frosting or icing recipe, use it! We love these cookies with simple vanilla or almond buttercream. 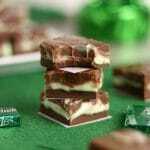 You can also use a glaze, icing, royal icing, store-bought frosting, cream cheese frosting or even eat them plain. This cookie does still taste good by itself but tasted better with a little frosting or something sweet on top. The cookie dough itself isn’t super sweet. 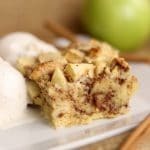 It’s a great cookie to add a little extra sweetness without making it too sweet. If you prefer homemade buttercream frosting you can add food coloring to make different colors to decorate with. 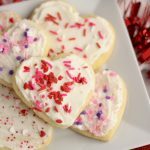 We stuck with white frosting when we made the ones in the pictures because we were decorating them with Valentine’s sprinkles and making over 100 cookies. That means each frosted sugar cookie cost me about 10 cents vs store-bought, preservative-filled that cost 30 cents. That’s a huge saving! Not only do these cookies taste better than store-bought, you can also make them into any shape and decorate them how you like! 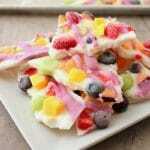 This is a great recipe to make with your kids or grand kids. Do you have a favorite family recipe that’s been passed down from generation to generation? I hope you enjoy these rolled sugar cookies as much as we do! A lightly sweetened, moist, cake-like sugar cookie with whipped vanilla buttercream frosting. Cut into any shapes you'd like and decorate with your favorite frosting, sprinkles and colored sugar. Mix together like pie crust (cut fat into flour and sugar) flour, sugar, salt, butter, and lard. DO NOT blend until combined. Only mix until pea-size pieces of butter and shortening form. In a small bowl, beat eggs and vanilla together. In another small bowl, mix sour cream and baking soda together. It will begin to "puff." Add egg mixture and sour cream mixture to flour mixture. Mix until dough forms. Split in half. Wrap each half in plastic wrap. Place in fridge for 1 to 2 hours or freezer for 30 min to 1 hour to chill. After chilling, pull out one dough at a time. On a well-floured surface, place chilled dough. Flour the top of the dough before rolling. Roll dough to 1/2 inch thick. Cut into desired shapes. This recipe will make about 60 2 1/2 inch round cookies. After cutting cookies, recombined dough and roll out once more to cut additional cookies and use the remainder. Place cookies on cookie sheet lined with parchment paper or a silicone mat. Leave 1-inch spaces between cookies. Cookies will enlarge as they bake. Bake immediately at 350°F for 10-12 minutes (will vary depending on how large or small you cut your cookies). Whip butter and shortening together for at least 2 minutes. Add vanilla. Add powdered sugar a little at a time. Mix for 1-2 minutes. While mixer is on medium speed, slowly pour in heavy whipping cream. Whip for 1-2 minutes. Store in fridge until ready to use. Bring to room temperature for easy spreading. This rolled sugar cookie dough can be frozen for up to 3 months. Before rolling out, thaw enough to roll. DO NOT bring to room temperature, keep chilled before baking. these cookies are the best! Hi April! I’m so happy you love these cookies too. They ARE the best! <3 Thanks for stopping by. I just love those wonderful cookies that my grandma use to make! My favorite is my grandma’s peanut butter cookies! Thanks so much Amy! <3 I love peanut butter cookies. 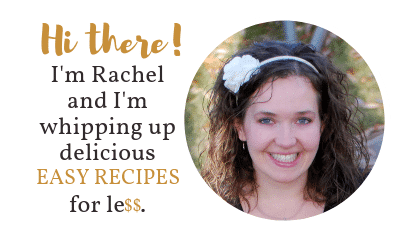 There are so many versions out there these days but the recipes passed down from generation to generation really are the best!